Add salt to a large pot of boiling water. Add approximately 25 ml of white wine vinegar to the pot —this helps maintain the integrity of the egg. Stir the water with a spatula or spoon to form a vortex in the water. This will help the egg white to evenly wrap around the yolk. Crack the egg and quickly slide it into the water. – it’s easier to do this by cracking an egg into a ramekin beforehand. Wait 3 – 5 min. until cooked and depending on how hard you want the yolks to be; continue to swirl the water. . 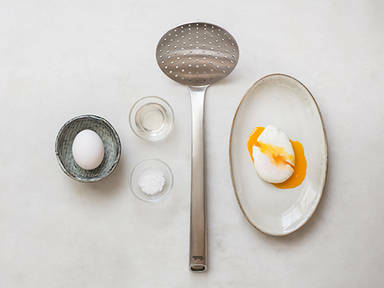 Remove the poached egg with a skimmer and place on paper towel to drain. Poached eggs are delicious with brunch, but they have a place at every meal. Pair with cod or kedgeree, or place on top of a potato dish like chorizo and potato hash for a scrumptious dinner. Alternatively, you can’t go wrong with some buttery toast and salt and pepper to serve with a perfectly poached egg.